2 bedrooms, 2 full bathrooms air mattresses available upon request. I only do 3 night minimum stays. Remember this when booking. The new Home Away system no longer allows rates to be set up with this as a default. This cabin is ready for you to relax and enjoy the peace of the mountains while you venture off to enjoy the outdoors. Go fly fishing in the cool mountain rivers and streams, whitewater raft at one of the two best rivers, take your motorcycle ride to the Tail of the Dragon, hike on one of the many trails local or on the Appalachian Trail, sight see to one of the many beautiful waterfalls, shop at the local antique stores or just sit and relax on the deck swing. No matter what you decide to do you will thouroughly enjoy your stay at Little Bear Cabin in Murphy, NC. The home has a king size bed in the master, queen size bed in the guest room, air mattress available upon request, fully equipped kitchen, washer & dryer, 37' LCD flat screen TV. We are ready to share this home and the mountains and luxury of Little Bear Cabin of Murphy with you. So come on and make your reservation. Photo ID is required for the rental of this property. We love it here in Murphy and want to share the great outdoors and the mountains with you. This 2 bedroom cabin is set back off of a quiet gravel road. While there are other cabins in close proximity, the trees hide them from view. My wife and I felt like we were hidden in the woods, while only a few minutes from the "downtown" area. The cabin is immaculate and the gas fireplace made our winter stay feel cozy and warm, despite the constant rain. Every time I have to travel to Murphy for work, I will certainly stay here again. Perfect location for what I needed, clean and well appointed. I needed a place that was pet friendly, close to town and that could accommodate me and another couple. This was just the place. It was clean, well appointed and just a couple of minutes to downtown, Murphy. Perfect for what I needed. I would stay at Little Bear again. We had a wonderful time at Little Bear Cabin. The cabin is nicely furnished and very comfortable. We went for a week’s get away and had a great time. Cozied up with the fireplace on the two really cold days and enjoyed walks, restaurants and the surrounding area the rest of the week. Beds are comfortable! Lots of amenities not usually provided so that was a nice treat! We will be back. Warm rustic with a updated rural flair. The property is gorgeous and very clean. 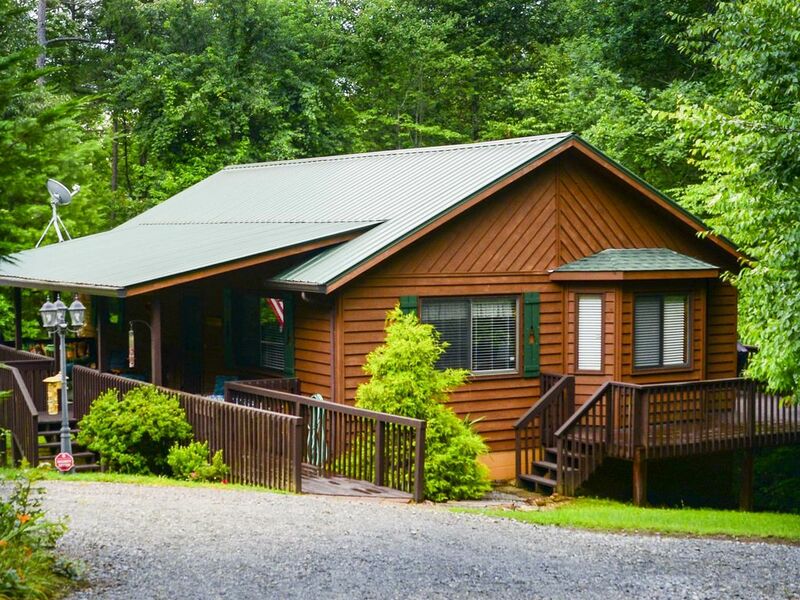 This roomy, open floor plan cabin is meticulously maintained and a very comfortable abode. We enjoyed our visit and will look to see if this is available on our next trip up. We had a visit from the snow fairy, and the local deer gang. 6 stars if possible. Perfect rental for our 2 week stay. Had everything we needed, clean, comfortable and close to town. Definitely would rent again and recommend to others !! 100 % REFUND IF CANCELLATION IS 30 DAYS PRIOR TO ARRIVAL FOR DAILY OR WEEKLY STAYS. 100 % REFUND IF CANCELLATION IS 60 DAYS PRIOR TO ARRIVAL FOR MONTHLY STAYS ALL HOLIDAY BOOKINGS NEED TO BE PAID IN FULL AT TIME OF BOOKING AND CANCELLATION IS NON REFUNDABLE. ARRIVAL. Photo ID is required for rental of this property.